If your computer is lost or stolen and you get a replacement Mac, you'll need to download and launch Arq on that Mac to restore your files. NOTE: If you were backing up to Amazon, the first thing you should do is disable the "key pair" that computer is using. Go to the Amazon Console Security Credentials page and make the key pair inactive. Or, if you were using an IAM user, go to the Amazon IAM Console and delete that user's key pair. Download and launch Arq on the new computer. Add the backup destination you were using before. If you were backing up to Amazon, you'll need to create a new key pair for accessing your Amazon account. See Create an AWS Key Pair. Follow the instructions in Finding and Restoring Your Files to restore your files. If you've set up your new computer the same as the old one (put your files in the same locations), you can choose to "adopt" the old computer's settings and data and avoid re-uploading. To do this, select the old computer under the "RESTORE FILES" section and click the "Adopt This Backup Set" button. 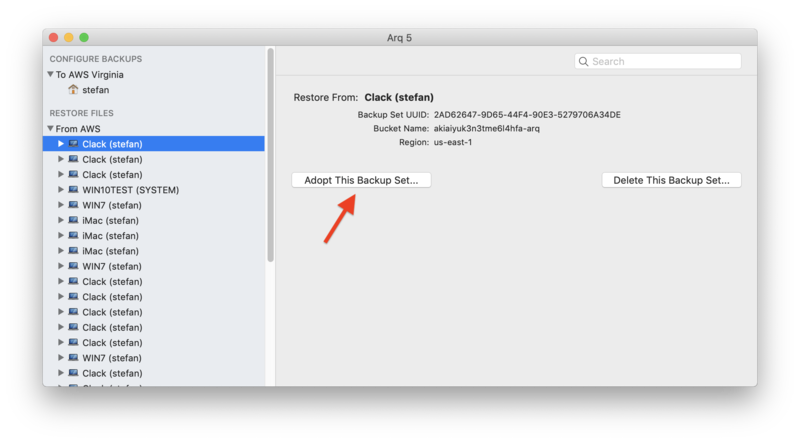 Arq will use the settings (which files to back up, which to exclude, etc) as well as the existing backup data as its starting point for subsequent backups.